The Browns and Terrelle Pryor seem to be growing more distant by the hour, and just after the start of the new league year, the wideout set his first visit outside of Berea. Pryor is set to visit with the Redskins, NFL Network Insider Ian Rapoport reported. It's an interesting first team to visit with, considering the turmoil reportedly stemming from Kirk Cousins' unhappiness with his contract situation and desire to be traded elsewhere. But for Pryor's camp, they need to field offers outside of Cleveland to gain any sense of leverage, and the first step to fielding offers is meeting with teams. We don't expect this to be his last visit. 1. Another wide receiver set to get paid on Thursday is Robert Woods, who is headed to the Rams after agreeing to terms on a five-year deal worth up to $39 million with $15 million guaranteed, Rapoport reported. The Rams are also signing quarterback Aaron Murray, Rapoport reported. 2. Safety Jahleel Addae has agreed to a deal to remain with the Chargers, Rapoport reported. Los Angeles is also signing tackle Russell Okung to a four-year, $53 million deal with $13.25 million guaranteed, Rapoport reported. 3. The Panthers are targeting Matt Kalil to be their new left tackle, Rapoport reported, per sources. That would bring him together with his brother Ryan Kalil, which would also kick Michael Oher out to right tackle, Rapoport added. Carolina are working on signing former Bucs wide receiver Russell Shepard, per Rapoport. 4. Defensive end Courtney Upshaw has agreed to terms to remain with Falcons, a source informed of the situation told Rapoport. Atlanta also signed defensive lineman Jack Crawford to a three-year, $10.3 million deal with $3.75 million due in the first year, and tight end Levine Toilolo to a three-year, $12 million deal, Rapoport reported. Atlanta released veteran defensive lineman Tyson Jackson, the team announced. 5. Ravens running back Kenneth Dixon has been suspended for the first four games of the 2017 season for a violation of the league's policy on performance enhancing drugs, the team announced. Baltimore also picked up receiver Mike Wallace's contract option for 2017. 6. Former Chargers linebacker Manti Te'o is visiting with the Saints, Rapoport reported. The Saints also signed defensive tackle Nick Fairley to a four-year, $30 million contract, Rapoport reported. 7. Running back Eddie Lacy is set to visit with the Seahawks, Vikings and Packers, Rapoport reported. 8. Safety Quintin Demps is signing a three-year contract with the Bears worth $4.5 million per year, Rapoport reported. Chicago is also signing tight end Dion Sims to a three-year, $18 million deal with $10 million in guarantees, Garafolo reported. Plus, the Bears are signing wide receiver Markus Wheaton, Rapoport reported. 9. The Lions have parted ways with linebacker DeAndre Levy, the team announced. Detroit has also signed defensive tackle Akeem Spence to a three-year, $10.5 million contract. 10. Jacksonville has released defensive tackle Sen'Derrick Marks, Rapoport reported. 11. The Bengals are keeping cornerback Dre Kirkpatrick, Rapoport reported. 12. The Chiefs have officially declined to pick up quarterback Nick Foles' contract option, NFL Network's Mike Garafolo reported. 13. The Browns agreed to terms with guard/center JC Tretter, the team announced Thursday. Tretter started for the Packers at center. 14. The Bills have released safety Aaron Williams, the team announced. Buffalo also announced the signing of five players: safety Micah Hyde, fullback Patrick DiMarco, guard Vladimir Ducasse, kicker Stephen Hauschka and safety Jordan Poyer. Hyde's deal is worth $30 million over five years, with $14 million guaranteed and a maximum possible value of $32.5 million, Rapoport reported. 15. The Saints are expected to sign Panthers linebacker A.J. Klein, Rapoport reported. 16. The Redskins are set to sign defensive tackle Terrell McClain to a four-year deal, Rapoport reported. Washington is also signing defensive tackle Stacy McGee to a five-year, $25 million deal, Garafolo reported. Washington also signed D.J. Swearinger to a three-year deal worth $4.5 million per year, with $6 million due in the first year, Rapoport reported. 17. Jacquizz Rodgers signed a multi-year deal with the Buccaneers, the team announced. Tampa Bay also announced it retained safety Chris Conte on a two-year deal. 18. The Patriots are working on a deal to retain defensive back Duron Harmon, Rapoport reported. New England is also working to keep linebacker Dont'a Hightower, with Rapoport reporting the Patriots are in good communication with the defender about a possible return. 19. The Dolphins have placed a first-rounder tender on restricted free agent linebacker Kiko Alonso, and original-round tenders on safety Michael Thomas and running back Damien Williams, the team announced. Tight end Anthony Fasano also signed a contract with the Dolphins on Thursday. 21. The 49ers signed linebacker Malcolm Smith to a five-year, $26.5 million deal ($13 million guaranteed), Garafolo reported. San Francisco also added kicker Robbie Gould, the team confirmed. Tight end Logan Paulsen has also signed with the 49ers and tight-end-friendly coach Kyle Shanahan. Former Falcons wide receiver Aldrick Robinson is set to follow Kyle Shanahan to San Francisco on a two-year contract worth up to $6 million, per Garafolo. Per Rapoport, the Niners are signing Matt Barkley - former Bears backup QB who impressed late last season. 22. Former Jaguars safety Johnathan Cyprien is heading to the Titans, Rapoport reported. 23. The Steelers re-signed quarterback Landry Jones to a two-year, $4.4 million deal, NFL Network's Aditi Kinkhabwala reported. 24. The Colts are signing outside linebacker/special teamer Barkevious Mingo to a one-year deal worth $2.5 million. 25. The Seahawks are attempting to fix their tackle conundrum by signing Luke Joeckel to a one-year deal, Rapoport reported. 26. Fullback Rhett Ellison is signing a four-year, $18 million deal with the Giants with $8 million guaranteed at signing, Rapoport reported. 27. The Jets have released running back Khiry Robinson, Rapoport reported. New York is are retaining offensive lineman Ben Ijalana for two years and $11 million, Garafolo reported. The team announced Thursday that it has re-signed outside linebacker Corey Lemonier and special-team stud Josh Martin. The Washington Redskins fired general manager Scot McCloughan on Thursday, a little more than two years after hiring him to revitalize their franchise. The move followed an offseason of speculation about his future within the organization and the reasons why there had been an issue, with perhaps past demons haunting him again. McCloughan was prevented from talking to the media at the Senior Bowl and did not attend the scouting combine, with the stated reason being his grandmother's death earlier in February. 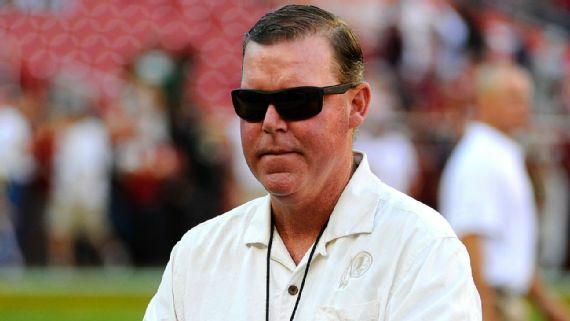 Team officials said they wanted McCloughan's focus on evaluating talent, but they had allowed him to talk to the media in previous offseasons, so it raised questions. His departure marks a stunning development because of how quickly he and the team reached this point. The Redskins hired him in January 2015 after winning just seven games combined in two seasons. The Redskins have finished a combined 17-14-1 the past two years, with one NFC East title. "The Washington Redskins have released Scot McCloughan from the organization effective immediately. We wish him success in his future endeavors. The team will have no further comment on his departure. The organization remains confident in our personnel department as we execute our free agency plans as well as prepare for the upcoming NFL Draft," team president Bruce Allen said in a statement. During McCloughan's tenure, the Redskins were unable to work out a long-term deal with quarterback Kirk Cousins. He played under the franchise tag in 2016, and the Redskins placed the exclusive tag on him earlier this offseason. Based on multiple conversations, McCloughan considered Cousins a good quarterback, but not a great one. He was not alone in the organization with that assessment. McCloughan's expertise was in finding personnel, but it remains uncertain how much his inability to build a stronger talent base contributed to his departure. McCloughan was fired from a similar job in San Francisco in 2010 and lost a front-office role in Seattle because of alcohol problems, which he discussed in an ESPN The Magazine article shortly before Washington hired him. They trailed him during his tenure in Washington, with multiple sources saying his drinking had become an issue again. The Post reported Thursday that McCloughan would show up in the locker room drunk before games, something a Redskins player confirmed. McCloughan has told acquaintances the drinking was not an issue. He could not be reached for comment Thursday. In his first news conference with Washington, McCloughan and Allen both said the drinking issues were discussed during their interviews. "I did talk to him about it, and we had a very forthright conversation, and we're here to support him," Allen said at the time. "And he would not be taking this job if he thought this would be a concern." McCloughan had a mixed personnel record in Washington. His first draft produced a Pro Bowl guard with the fifth overall pick in guard Brandon Scherff. He also drafted a solid slot receiver in Jamison Crowder in the fourth round. But McCloughan's second-round pick, Preston Smith, has been inconsistent. Running back Matt Jones opened last season as the starter, but lost his job by the midway point. Last year, none of the Redskins' seven picks was a full-time starter. Second-rounder Su'a Cravens was moved from being a nickel/dime linebacker to safety, where he'll play this season and likely start. First-round pick Josh Doctson appeared in two games because he injured his Achilles a month after the draft and could never shake the problem. Of McCloughan's 17 draft picks, 13 remain on the roster and three are projected starters -- if healthy, Doctson would make that four. The Redskins' free-agent record under McCloughan wasn't great. Two offseasons ago he signed corner Chris Culliver, end/tackle Stephen Paea, nose tackle Terrance Knighton and safety Jeron Johnson in the free-agent period (adding linebacker Junior Galette early in camp). The Redskins also traded for safety Dashon Goldson. Only Galette is still around, though he has missed two seasons after tearing both Achilles. They did add defensive back Will Blackmon, kicker Dustin Hopkins and linebacker Mason Foster during the season -- all became key contributors. Last offseason, they made corner Josh Norman the highest-paid player at his position. He was a solid addition. They also signed end Kendall Reyes and safety David Bruton, both of whom were eventually released, and tight end Vernon Davis among others. McCloughan has worked in the NFL since joining Green Bay as a scout in 1994. Since 2000, he has held five various front-office titles with Seattle, San Francisco and Washington. He founded his own player evaluation service in 2014, the one year he spent out of the NFL. 0 Response to "Roundup: Terrelle Pryor visiting with Redskins"